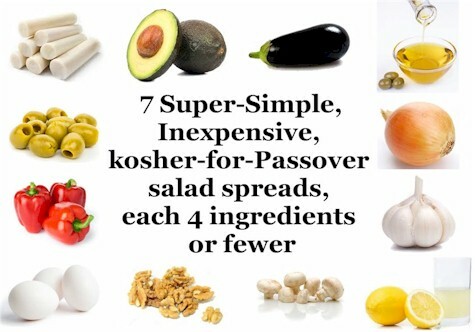 One of my "rules" for Passover meals is to keep it simple and get back to basics. Here are seven uncomplicated "recipes" for Pesach-friendly spreads and dips. They each have four ingredients or fewer. Putting these spreads out all at once makes for a great appetizer course. For fun presentation, I like to put them in little glass bowls around the seder plate (with one bowl in the middle). You can serve these with matzoh, KFP matzoh "crackers," or even just plain raw veggies. You will need a KFP food processor to process/puree most of these. Olive Tapenade: Open two cans of KFP pitted Israeli olives, drain, process until smooth. Add a teaspoon of extra virgin olive oil if you need to. Roasted red pepper spread: Roast three washed and cored red peppers until just starting to brown. Process until smooth. Add a teaspoon of extra virgin olive oil if you need to. Basic Babaganoush: Peel, slice and roast one large eggplant until light brown. Puree with a teaspoon of lemon juice until smooth. Add a teaspoon of extra virgin olive oil if you need to. Basic Guacamole: Puree 2 avocados with a tablespoon of lemon juice and two roasted garlic cloves until smooth. Mushroom "Pate:" Saute 12 sliced mushrooms with a chopped onion in EVOO for about 10 minutes. Puree with 1/2 cup shelled walnuts until smooth.